2.1. How does an argument attack or support a sentence? 2.2. How does an argument attack or support another argument? This tutorial describes how the reconstruction of the debate about software patents begun in Chapter 2, Sketching a debate can be continued and expanded. After sketching part of the debate in the first tutorial , we will now begin with the logical reconstruction. It will be explained how to enter the premiss-conclusion-structure of arguments into the argument editor and define the attack and support relations using the reconstruction wizard. In the map view, double-click the argument to be reconstructed. Another view opens next to the argument map, the argument editor (see Figure 3.1, “the argument editor” ). 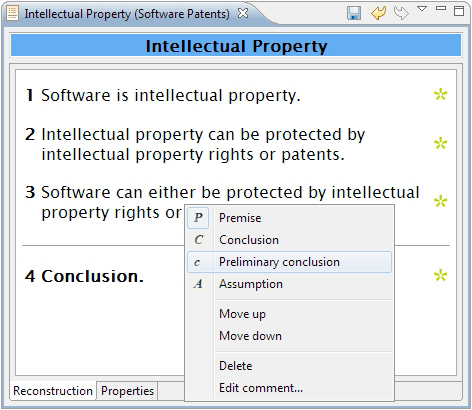 In the argument editor, the logical premiss-conclusion-structure of an argument can be reconstructed. From a logical point of view, an argument consists of a statement for which reasons are given and one or more statements which give reasons for this statement. The former ist called "conclusion", the latter are called "premisses". The premisses are listed one below the other in the argument editor. The conclusion follows below an inference line. If the argument has more than one logical step, preliminary conclusions can be inserted. They are also preceded by an inference line. Start with the logical reconstruction of the argument "Intellectual property". To enter the first premiss , click into the text box First Premiss next to the number "1.". 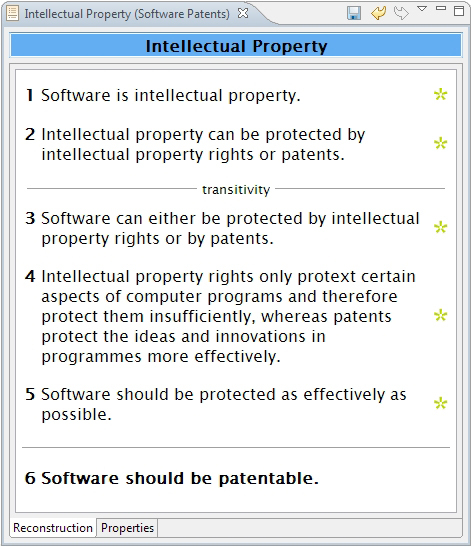 Enter the sentence for the first premiss: Software is intellectual property. To enter the second premiss , click into the text box next to the number "2. ", and enter the sentence for the second premiss: Intellectual property can be protected by intellectual property rights or patents. Position the cursor at the end of the sentence below which you want to insert a new premiss. A new sentence is added. You can now continue with the reconstruction. Deleting a sentence is also similar to the deletion of elements from a list in a word processing programme. Highlight the whole sentence, and press the DELETE key. Changes carried out in the argument editor can be saved by clicking the Save button ( ) or using CTRL + S.
By clicking the Undo button , you can undo changes in the argument editor. By clicking the Redo button, you can restore changes that were undone. Add a new sentence, as described above. 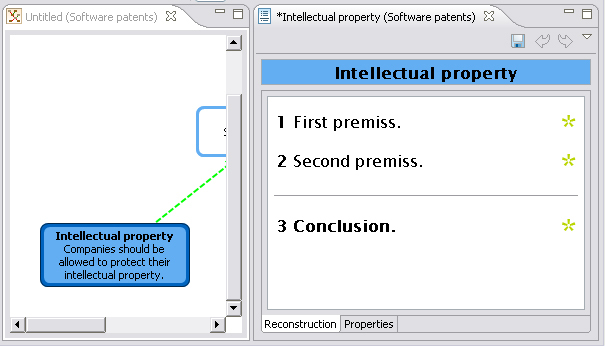 To enter the preliminary conclusion of the argument "Intellectual Property", click into the text box of the new sentence. 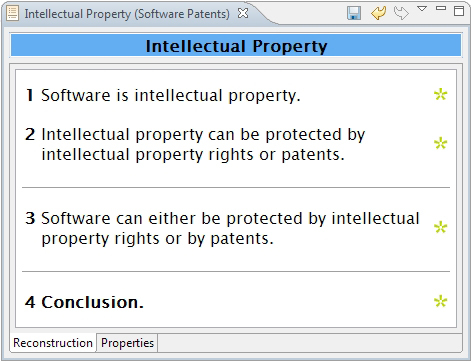 Enter the sentence for the preliminary conclusion: Software can either be protected by intellectual property rights or by patents. Right-click on the sentence you have just entered. 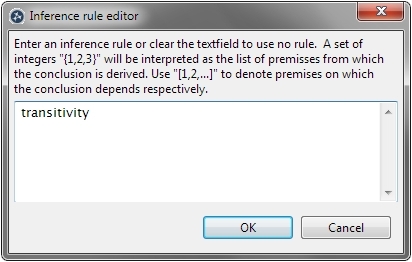 A context menu opens from which you can select the role of the sentence in the current argument. Select Preliminary conclusion from the list. Figure 3.2. Setting the sentence role to "preliminary conclusion"
Optionally, you can specify an inference pattern for a preliminary conclusion or a conclusion. Double-click on the inference line above the preliminary conclusion you have just inserted. The inference pattern editor opens. Enter the inference pattern transitivity , and click OK . The new inference pattern appears in the middle of the inference line. Now add two more premisses. The first is as follows: "Intellectual property rights only protect certain aspects of computer programmes and therefore protect them insufficiently, whereas patents protect the ideas and innovations in programmes more effectively." The second: "Software should be protected as effectively as possible." Now the conclusion that software should be patentable can be inferred. The conclusion is the sentence below the last inference line. Enter "Software should be patentable" here. The reconstruction of the argument is now complete. Click the Save button. A wider border will then appear around the argument on the argument map. This border indicates that the argument has already been reconstructed. Figure 3.5. The reconstructed argument "Intellectual property"